For Christmas gifts to our friends this year, I was planning on making decorated sugar cookies. However, for whatever reason, time got away from me. 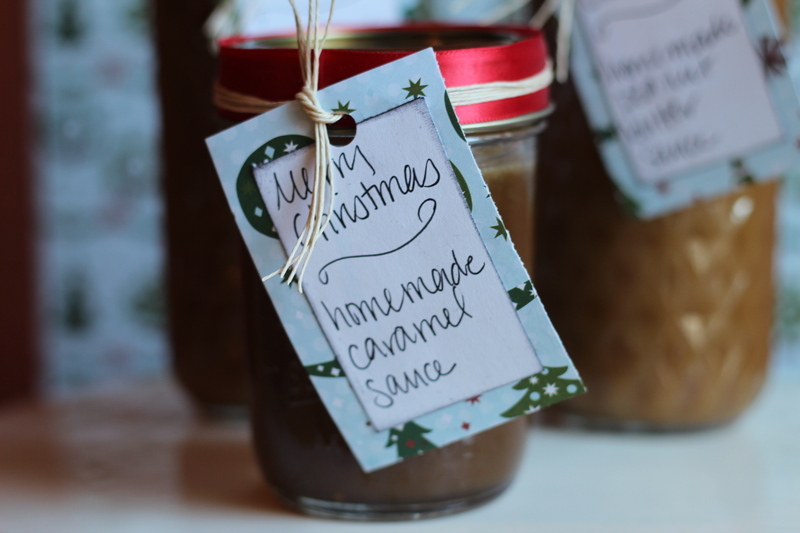 As I was looking through my stash of pages I’ve torn out of magazines, to help me come up with some simple ideas, Southern Living had an article a few years ago about making homemade chocolate sauces. 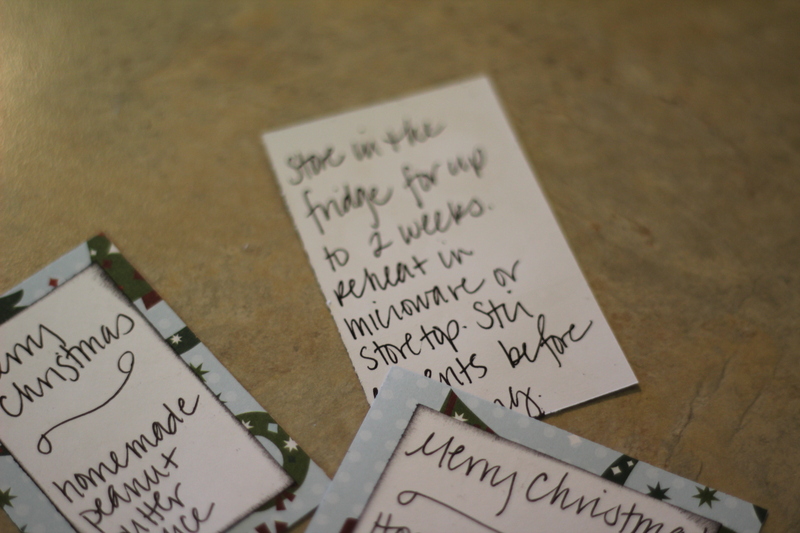 A little light bulb went off in my head, (you know, like Gru when he says “liiiiiiiiight bulb”), and I realized it would be the perfect gift this year to make for the loved ones in our lives. 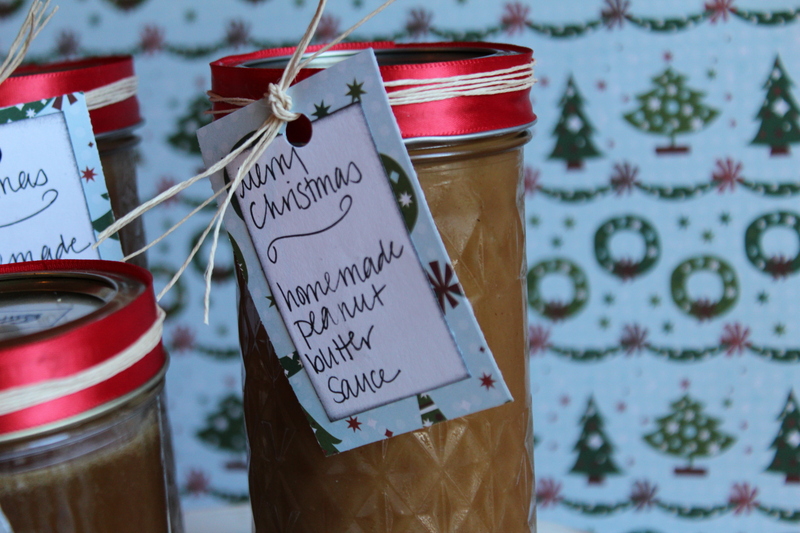 I decided to make two different sauces–one caramel and one peanut butter. And if you’re a skeptic, this peanut butter sauce is fantastic over vanilla ice cream. I’d even be tempted to drizzle it over brownies. It’s smooth, creamy, and melt-in-your-mouth delicious. And not being a huge caramel fan, (except when it’s caramel apples), I had a hard time not keeping some for myself. 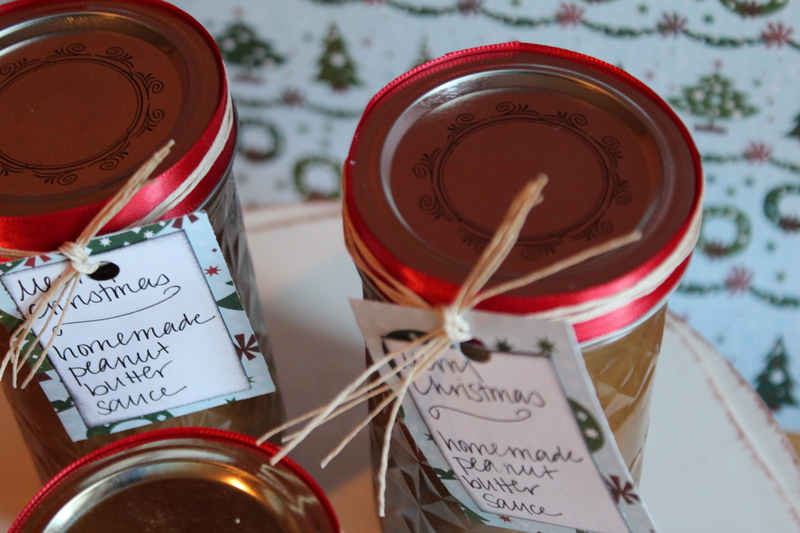 I bought glass canning jars at the grocery store (that had a cute pattern on it), and ribbon and twine from the craft store. 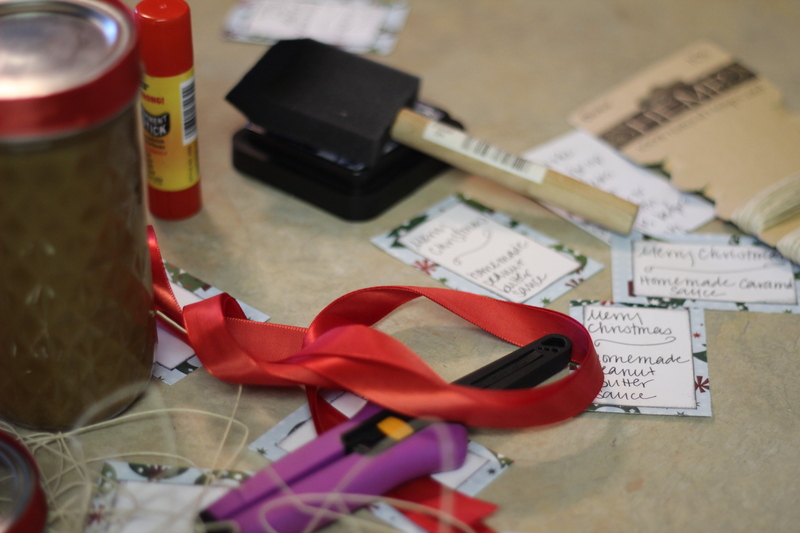 Using scrapbook paper and other scrapbooking materials I had on-hand, I created tags to go with the jars. For the tags, I labeled what type of sauce it was on the front, and some instructions on the back. 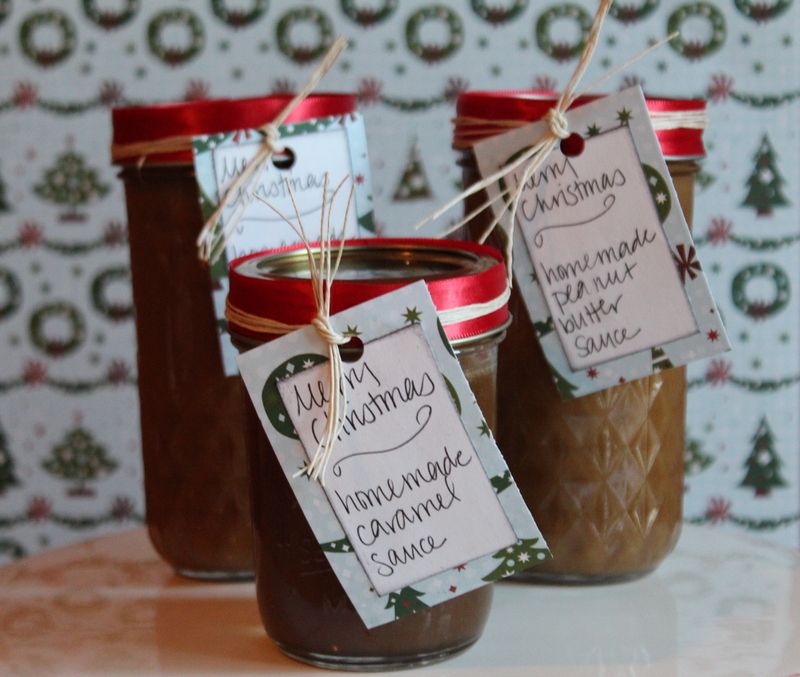 Once the sauces were done, I poured them into the jars, closed the lids, and put the twine and label around the perimeter of each lid. In a small saucepan, combine the sugar, butter, and heavy cream. Heat over medium-high heat until mixture boils, stirring constantly. Once it boils and the butter is melted, turn heat down to simmer, and cook for 5 minutes, stirring occasionally. Remove from heat and add vanilla and salt. The sauce will keep for up to 2 weeks in the fridge. To reheat, place mixture in a small saucepan and heat over medium heat, stirring constantly. Dissolve brown sugar and corn syrup in a medium saucepan over medium-high heat. Remove from heat and add the peanut butter and unsalted butter. Once it is all thoroughly mixed, add the half and half. Mix until all is fully combined. The sauce will keep for up to 2 weeks in the fridge.